What is the minimum notice period that an employer can give? If your length of service is between 2 years – 12 years the employer needs to pay you 1 week’s notice for every year that you have work there up to a maximum of 12 weeks. If you have agreed a longer notice period within your contract then the employer must pay you this, unless you are dismissed for gross misconduct, in which case, the employer does not need to pay you any notice. If your employer does not provide you with you statutory or contractual notice period then you may be able to claim for wrongful dismissal in the employment tribunal. Are employee’s required to give a notice period to their employer? Employee’s are required to provide 1 week’s statutory notice to the employer, unless otherwise stated in their contact. If the employment contract states longer than a week’s notice then the employee must serve this as there notice period. In this case, the statutory notice period does not increase with length of service. Notice can be provided verbally, but it is preferable to provide this in writing, for instance as a letter or an email. This can ensure that if a dispute arises, then there is evidence of when the notice period began. What should the employer pay an employee during their notice period? Employees are entitled to be paid their normal salary during their notice period. This includes holiday pay, maternity pay and sick pay if they are entitled to receive this. NB. It should be noted that if the employer decides that they do not want to provide the employee with any work during the notice period, but the employee is available to work, then the employer must still pay the employee during this period. This would be considered gardening leave. Can an employee take holiday during their notice period? Legally, employees are allowed to insist on taking holiday during their notice period, as long as they have accrued enough untaken holiday for the period required. The employee must also give reasonable notice that they will be taking holiday during their notice period, in order that the employer has time to make alternative arrangements to cover the period. The employer is able to refuse the request to take holiday during their notice period, as long as there is a valid business reason. Can employee’s be forced, by their employer, to take holiday during their notice period? According to the working time regulations, employers are able to force employees to take some or all of their accrued annual leave during their notice period. They must specify the dates that they wish them to take and must also give adequate notice (at least twice the length of time that the employer wants them to take). During an employees notice period, does annual leave still accrue? Yes. Annual leave still accrues during and employee’s notice period. This is usually the statutory minimum. It may be possible to claim for additional accrued annual leave, depending on what the employment contract states. What is if an employee has taken more holiday that what has accrued at the date of termination or resignation? If this is the case, the employer is able to lawfully deduct pay from the employee, but only if the contract expressly provides for this. What if an employee does not want to serve their notice period? If an employee decides not to work their contractual notice period, then the employer cannot force them to work. Having said that, technically, the employee is in breach of contract. It is only in very rare circumstances that the employer may sue the employee for this, for instance to costs incurred finding replacement staff or working within their notice period for a direct competition. This would only usually apply to more senior positions. In these circumstances, where an employee decides not to work their notice, the employer does not have to pay the employee their notice pay. They may, however, try to deduct pay from the employee for the time that they have already worked, to cover costs the company have incurred due to the breach of contract. However, unless stated within the employment contract, the employer is not entitled to make these deductions and the employee could potentially sue for unlawful deduction of wages. What is ‘Payment in Lieu of Notice” (PILON)? If the employment contract allows for payment in lieu of notice, then the employer is able to pay the employee for their notice and terminate the contract with immediate effect. If there is not provision within the contract for this, then the employer may be in breach of contract, which could also effect other provisions within the contract and make them unenforceable, for example, restrictive covenants. What is there is not provision for PILON within the employment contract? They can place the employee on gardening leave, if the employment contract allows for this. This means that the employee does not have to come to work but are still bound by the terms of their contract until the notice period is complete. The other option is that the can agree and early termination and provide the employee with a payment of compensation. This would need to be in the form of a settlement agreement. 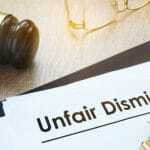 What if an employee is dismissed without notice? Employers are able to dismiss employees without notice if they have committed an act of gross misconduct. Gross misconduct occurs when an employees commits a serious offence at work, for instance, stealing, physical abuse, serious health and safety breaches or serious neglect. In this case, the employer would have to follow a fair procedure in order to dismiss the employee. What is a Fair Redundancy Trial Period?